Bug4H wants to take part in the 4H Rabbit Hopping when she gets her pet bunny. Which breed would be better - Dutch or Mini Rex? Or maybe a standard Rex, if we can find one. 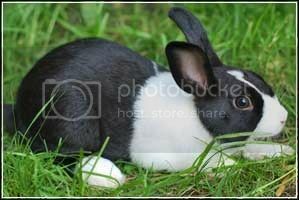 Re: Rabbit hopping / jumping - Mini Rex or Dutch ? Rex and mini rex sometimes have problems with sore hocks and sparse foot fur, so if it were my choice between the two, I'd go with dutch. As long as the mini rex is well bred, you will never have an issue with sore hocks. Just make sure its feet are thickly furred. Standards seem to have more an issue with this. I bred mini rex for several years and never dealt with sore hocks. Ultimately its up to you. Just keep in mind both of the breeds are smaller stockier breeds, that wouldnt excel in hopping as much as your full arched breeds, like English Spots and Tans.